The Nancy Daly Memorial Salon Series provides the opportunity for Everychild Foundation members and their guests to attend informative presentations about a variety of issues. 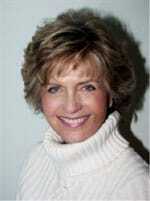 The series is named after Nancy Daly, a prominent Los Angeles child advocate who passed away in 2009. Nancy was an Everychild member and one of our first salon speakers. Salons are usually held in the evening in the home of an Everychild member. Speakers focus on issues facing children in our communities. The purpose of the salons is for our members, who may attend with their spouse or a guest, to become more knowledgeable in their role as grant-makers. Changes in media consumption, including declining newspaper circulation and a global readership, have altered news coverage. The Everychild community met at the home of member Judith Beckmen on April 25, 2018 to discuss news reporting of children in a changing media landscape. 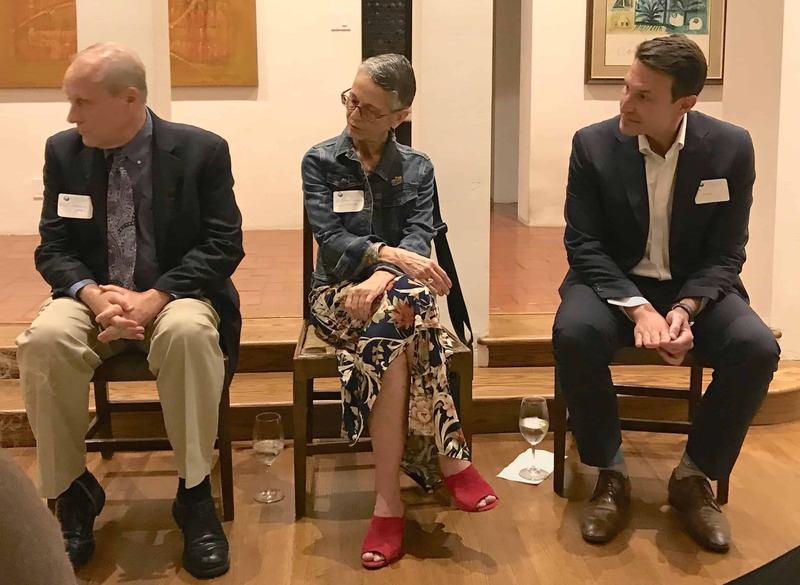 As part of the Everychild Foundation Nancy Daly Salon series, the panel spoke on the challenges of keeping journalists focused on issues facing vulnerable children, youth and families, and the importance of holding child-serving systems and their leaders accountable. The panel included: Robert Greene, editorial writer of the Los Angeles Times, who covers water, drought, criminal justice reform and Los Angeles County government; Celeste Fremon, editor and founder of WitnessLA, a nonprofit online news site; and Daniel Heimpel, president of Fostering Media Connections, a national non-profit news organization and publisher of The Chronicle of Social Change. They spoke of the limitations of their coverage and the importance of substantive reporting being a catalyst for social and political change. Fremon, who had previously written for mainstream publications, increasingly felt that many important issues were not being covered. This gave birth to her experiment, WitnessLA, where she started to fill an astonishing hole and found that its stories could move the dial on public policy. Heimpel also sees his organization as a watchdog and conduit to query people in power, which forces them to understand and confront an issue. But he says nonprofit journalism is only part of the answer. He describes a media ecosystem that depends on relationships – like that of The Chronicle to the Los Angeles Times – to affect policy change. “Unless the nonprofit journalism entities start getting the readership and distribution paths that the mainstream legacy news outlets have, we are beholden to having partners out there that we can work with to amplify those stories,” Heimpel said. The panel also spoke of the digital media environment affecting news coverage and how for-profit news publications depend upon the numbers of clicks per online story. “Since a click from somebody living in Mozambique is just as good to us as a click from somebody living in Encino, we’re going to look at a broader national perspective and produce a lot fewer pieces that impact us as residents in the community (such as local children in crisis), which is a shame,” Greene said. However, Heimpel believes the answer is good storytelling that will transcend global readership barriers. On Thursday, September 28, members of the Everychild Foundation convened to discuss the challenges of children facing homelessness. The gathering was held at the home of Board Member Emeritus Denise McCain-Tharnstrom, Founder of Our Children LA, a nonprofit that connects these youths with web-based resources and support systems. As part of the Nancy Daly Salon Series, speakers Tanya Tull, ScD, Founder and President of Partnering For Change, and Melissa Schoonmaker, Consultant II, Homeless Education, Los Angeles County Office of Education (LACOE), shared their research on the large number of Los Angeles’ children affected by homelessness and the significant impact on their physical health, cognitive development and social and emotional well-being. Schoonmaker, who serves as LACOE’s Homeless Liaison, supports 80 school districts and over 200 charter schools within Los Angeles County to meet the educational needs of the nearly 63,000 youth identified across the county as lacking a permanent home. According to Schoonmaker, some of these problems can be alleviated with increased state and federal funding, a statewide data system and access to needed resources, such as school supplies, transportation and counseling. Schoonmaker believes that no single system can meet all of the needs of young children and parents experiencing homelessness; cross-system collaboration is critical. The goal is high quality, affordable housing, safe neighborhoods and improved physical and mental health. Tull added that frequent mobility and stress associated with unstable housing not only inhibits healthy child development, but may also lead to child abuse and/or neglect. Her agency, Partnering for Change, promotes and facilitates strategies in the community that ensure access to stable and adequate housing for child and family well-being. She believes that early intervention and timely responses to indicators of housing distress can help stabilize a precarious housing situation before the problem can escalate. Her organization identifies and addresses the challenges that each family faces with individualized approaches from improving a family’s housing to helping them relocate to more affordable neighborhoods. “There is always something we can do. It may be out of the box, but that’s what innovation is all about,” Tull said. For more information, visit Partnering for Change and LACOE. The Actors’ Gang objectives are to provide theatre to under-served youth; to engage students in a professional theatre environment to help cultivate fundamental life skills; and to increase attendance and involvement in Performing Arts and to further advocate for arts in education. The organization also conducts classes and workshops with inmates in prisons and Juvenile Re-Entry programs. A group of Everychild members and guests gathered at the home of Tracy and Chris Esse on February 5 to discuss children’s issues with Ted Lempert, President of Children Now, a national research and advocacy organization based in Oakland. The non-profit concentrates its efforts on analyzing policies for children in California and promoting large-scale public policy changes needed to improve the lives of children. Mr. Lembert then shared data with the group developed by Children Now comparing education, health and child welfare statistics for Los Angeles County with other counties in the state. This information provides a valuable tool for children’s advocates and policy makers to get a clear and concise picture of the areas of most need. Discussing the problems with the state’s services for children, Lempert said there is widespread support for funding and legislation related to children. However, one of the major obstacles to moving forward is the “silo” effect, which leads to a lack of collaboration among the many advocacy groups. According to Lempert, this creates a situation where we end up spending a lot of money helping children, but we don’t get enough in return. “There is a strong need for ‘sophisticated advocacy’ by all groups coming together,” he said. For more information on Children Now, click here to visit their website. On Wednesday, September 3rd, Everychild Foundation members and friends gathered in the home of Leslie and Bill Elkus to hear Congressmember, Karen Bass, Co-Chair, Congressional Caucus on Foster Youth, discuss the new national movement to reform our nation’s broken foster care system. While Speaker in California, Bass championed a bill that extended the foster care emancipation age to 21 – helping youth continue to be supported during crucial years of development. Now in the U.S. House of Representatives, she introduced two bills honoring and assisting foster youth. First a Congressional Resolution Recognizing May as National Foster Care Month, honoring foster youth and parents. Second, H.R.2012 Foster Care Mentoring Act focused on connecting foster care youth with responsible, caring adults. If you would like to support this effort, click here. Photo: Congressmember, Karen Bass with Jacqueline Caster, Founder and President of Everychild Foundation. Gerald F. Kominski, Ph.D. was the featured speaker at the Everychild Nancy Daly Memorial Salon on the Affordable Care Act (ACA) held on January 29 at the home of Susan Brauneiss and Mark Gamsin in Brentwood. The salon focused on the ACA and what it means for children in Los Angeles County. Dr. Kominski is the Director of the UCLA Center for Health Policy Research and a professor at the UCLA Fielding School of Public Health. His current research focus is on evaluating the expected and actual impacts of health care reform. In his opening remarks, Dr. Kominski told the group of more than 30 that he thinks the worst is over in terms of the problems with the on-line registration process that have plagued the program since it was launched. “We have seen a great improvement in the ease of enrollment since November, and the enrollment numbers are increasing to an acceptable level,” he said. Dr. Kominksi then explained in simple terms the general provisions of the ACA, with an emphasis on who qualifies for health care insurance under the plan and the coverage provided by the Platinum, Gold, Silver and Bronze plans. Focusing on how children will benefit from the ACA, Dr. Kominksi, said that there are 496,000 uninsured children in California. Of these 325,000 are already eligible for benefits through Medi-Cal and the Healthy Families program. Undocumented immigrant families and their children are not eligible to participate in the ACA. While the ACA mainly is designed to insure adults, it has greatly increased awareness of the importance of insurance and, in turn, should increase the number of children whose parents sign them up for programs appropriate for their income level. Other advantages of the ACA for children include the 140,000 children whose families now qualify for subsidies to buy individual policies through Covered California and foster children who are not forced to “age out” of Medi-Cal at age 21 because they are now covered to age 26. After his formal presentation, Dr. Kominski took questions from the highly engaged audience. A variety of questions were posed which led to a lively discussion between the speaker and attendees that only ended due to the lateness of the hour. California State Senator Ted Lieu was the featured speaker at The Everychild Foundation’s Salon on September 26, 2013. 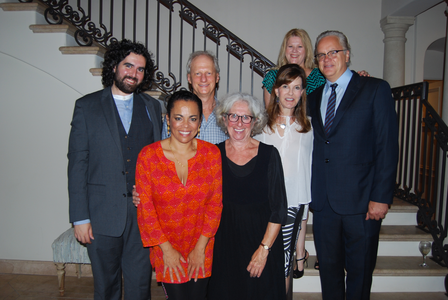 Part of the Nancy Daly Memorial Salon Series, the evening event was held at the home of Everychild member Amy Childress and her husband James, and was attended by close to 30. 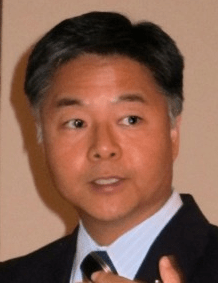 Lieu cited Everychild President Jacqueline Caster’s persistence as one of the main reasons he dropped his opposition and became a strong proponent for Senate Bill 9 (SB9) last year, the third time it was put forth. SB 9, which was signed into law last year, allows juveniles who had been given life sentences without the possibility of parole the chance to have their sentences reviewed and to be released after serving a minimum number of years. The Senator cited the current scientific information on adolescent brain development that Jacqueline provided him as the reason for his changed position. His turned out to be the deciding vote (21st out of 40) that assured the bill’s passage. A lively discussion about how juveniles should be interrogated and properly represented ensued. References were made to “The Scottsboro Boys”, “The Central Park Five”, and Amy Sommer Childress’s documentary “The Jaundiced Eye” and the troubling role that false confessions have played in wrongful convictions over the decades. Following the discussion about the lack of defense resources for juveniles, Lieu stated that some of his best bills come from meetings such as our Salons. He said he would further research the possibility of legislation requiring counties to provide the same defense resources for juveniles that adults are ensured. Divorce, no matter what the reason or how much the parties try, is difficult for everyone, especially the children who are often in the middle of the struggle. On November 5, 2012, close to 50 people gathered at the home of Everychild member Jaime Meyer for a salon to discuss this important issue. The evening’s speakers featured The Honorable Thomas Trent Lewis, Judge Superior Court, County of Los Angeles, President of the Association of Family and Conciliation Courts – California and Mary Elizabeth Lund, Ph.D, Psychologist, Custody Evaluator, Mediator; President – Elect of the Association of Family and Conciliation Courts – California whose work and presentation focused on ameliorating the collateral damage inflicted on children when two lives that used to be joined separate. Through their interdisciplinary collaboration, Lewis and Lund are working to minimize children’s exposure to conflict because even in happy homes, conflict scars, “My parents have had a relatively good marriage for 65 years and I still remember a fight that they had when I was seven years old – you can pull up a conflict very clearly for a lifetime,” said Lewis. For parents who are separating, diminishing conflict, “often involves minimizing face-to-face exchanges so kids don’t have to see their parents glaring at each other,” said Lund who commented shortly thereafter that doing this is becoming more and more of a challenge as the social service systems that work with the courts are being drastically cut. Toward this end, Lund has created Collaborative Family Law to provide a venue for all parties to be heard and for the child’s interest to truly be a priority while minimizing the financial and emotional devastation of divorce. Lund noted that there is strong research that supports putting high conflict parents in psychological educational groups where they are led through structured educational exercises, similar to a program available through the court system until its funding was cut. Lund is also a fan of “Kids’ Turn” (http://kidsturn.org) available via the Family Law Courts in San Francisco but not in Los Angeles. Supervised visitation is another victim of the current cost cutting to support programs for those going through the Family Law system. “There are cases where I have to order it but there is no funding for a supervisor and the family can’t afford it independently,” said a clearly frustrated Judge Lewis, “I have to make these orders where there is evidence of abuse but I know that when I do, that dad won’t see that kid because of the cost and there are no grants available. The court is not a social welfare program, this is not the court’s place, but we do need the support of such services,” Lewis added. The Everychild Foundation sponsors occasional salons to discuss important issues impacting children in the Los Angeles area. The series is named in memory of Nancy Daly, a children’s advocate and Everychild Foundation member. At a first-ever candlelight salon, Kirk and Laura Smalley shared the tragedy of their son’s 2010 suicide after a bullying incident. They now work tirelessly to prevent another family from enduring their hell. 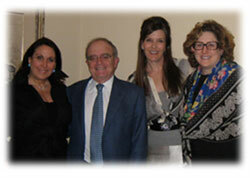 The salon was held on March 12th at the home of Everychild member Amy Sommer. The candlelight was necessitated by an unexpected power outage in the neighborhood. “For Laura and I, it’s not just a subject, it’s become our life,” said Kirk Smalley as he began his presentation. Through the couple’s non-profit, Stand for Silent, Smalley has presented to over 300,000 students at schools and youth groups in Oklahoma and California. Citing scary statistics – a child is bullied once every seven seconds in our country and 25%, that’s one in four kids, not only think about suicide but have a plan as to how they would carry it out – Smalley explained how bullying is damaging our society. Bullying is a learned behavior, Smalley explained after relating some of the stories behind the aforementioned statistics; Kirk and Laura are speaking to students in an effort to help them unlearn it. Smalley blamed everyone — violent media, school counselors who are so overwhelmed with paper work that they don’t have time to counsel, and parental behavior – for the increase teaching of our bullying problem. Smalley’s efforts to help children unlearn this behavior centers on his ability to connect with kids through his family’s tragedy and to give the 70% of children who are bystanders the strength to stand up against this scourge. Whether these bystanders intervene on behalf of the bully’s victim or to help the bully change his or her negative behavior they are standing up for the silent and changing the culture of the schoolyard so that bullying is not tolerated. For more information on the program go to : www.standforthesilent.org. Former Supreme Court Justice Sandra Day O’Connor spoke to a group of more than 60 Everychild members and their guests at a Nancy Daly Salon Series special event on February 25, 2012. The evening focused on the justice’s efforts to reverse the declining knowledge about civics in the U.S. and her efforts to turn this trend around through www.iCivics.org, which provides free educational materials for teens, parents and teachers. In an intimate setting, the evening began with Justice O’Connor responding to moderator and gracious host (along with his elegant wife, Everychild member Pamela) Jarl Mohn’s questions about her childhood on an Arizona ranch, her education at Stanford, her legal career, and her tenure as the first woman appointed to the U.S. Supreme Court. Speaking about her early years with humor and charm, Justice O’Connor told of her struggles to be accepted in the legal world that was dominated by men. A 1952 graduate of Stanford Law School, she was unable to get a job with a law firm. If she was not rejected outright with the words “we don’t hire women lawyers”, she was told she could work in the steno pool typing briefs. She prevailed and became an assistant attorney general in Arizona in the 1960s, served in the state senate, and as a Superior Court judge. She was appointed to the Supreme Court by President Ronald Reagan in 1981 and retired from the court in 2006. This concern led her to found www.iCivics.org in 2009. iCivics prepares young Americans to become knowledgeable, engaged 21st century citizen by creating free and innovative educational materials including interactive, online games and curricula available to schools free of charge. “Securing our democracy requires teaching the next generation to understand and respect our system o f government,” said Justice O’Connor. In just two years, iCivics has produced 16 educational video games as well as teaching materials that have been used in classrooms in all 50 states. For more information, go to www.icivics.org. Martha and Ronald Doornick opened their beautiful Manhattan Beach home to host the thirteenth Everychild salon on January 21, 2009. The topic of the salon was “Our Chance to Advance Educational Opportunities for all of Los Angeles’ Children”. Marshall Tuck, CEO of the Partnership for Los Angeles Schools and Advisor to Mayor Antonio Villaraigosa spoke. Everychild member, Melanie Lundquist, Board Member and Senior Advisor for Fundraising at The Partnership, began the evening by recounting that she and her husband both received good educations through the Los Angeles Unified School District (LAUSD) and as a result had good lives. Watching the decline in the quality of education in the District has, therefore, been distressing for them. However, when Mayor Antonio Villaraigosa began his campaign promise to improve LAUSD, ultimately resulting in the Partnership for Los Angeles Schools in late 2007, the Lundquists enthusiastically jumped aboard with a major gift and have become its strongest supporters. The Partnership is charged to work with the myriad of educational agencies, unions and interest groups to develop and implement reforms, based on research, which will dramatically improve the 800 LAUSD schools and 725,000 students. Currently in its first year of operation, the Partnership is working with 18,000 students and 1,500 employees at low-performing schools throughout the district. “There are good people who care about kids who go to work every day. They’re under-supported, maybe [even] under-educated but they’re there doing it…. There are great kids at these schools too,” said Mr. Tuck as he outlined the problem caused by the current, hierarchical structure of decision-making within LAUSD. He explained that the District spends too much money on administration verses promoting the one crucial element of a great education; teacher-student interaction. Unfortunately, there has been very little outcry about the situation because many families with the most resources often opt out of public education, leaving behind those with less political clout. The Partnership aims to improve this situation by implementing many of the reforms used in charter schools for all schools. Our economy is now a knowledge-based and students must attend college if they are to succeed. Because our country’s manufacturing base has shrunk, thus reducing the need for skilled labor substantially, it is imperative that we teach all of our students critical thinking and other such skills for them to succeed. With trained, dedicated enthusiasts like Mr. Tuck, the Lundquists and the Partnership Los Angeles, and those who teach our children may finally have the needed political and financial will to actually improve the education of every child in our environs. 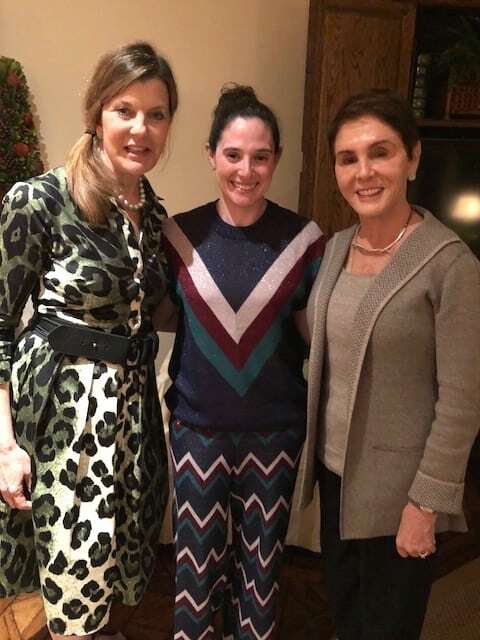 Two outstanding women who are dedicated to helping children with autism and their families spoke at the Everychild Foundation salon, “Advances in the Research and Treatment of Autism Spectrum Disorders”, on September 25th at the home of Everychild member and Salon Committee Chair, Amy Childress and her husband James. 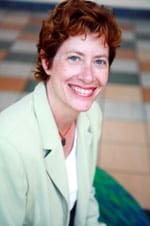 Michele Kipke, PhD, is a professor in the Department of Pediatrics and Preventive Medicine at the USC Keck School of Medicine, Associate Director of the Saban Research Institute, and Director of Community, Health Outcomes, and Intervention Research (CHOIR) at Children’s Hospital Los Angeles. She was joined by Pat Grayson-DeJong, the mother of a son who is challenged with autism and an advocate for parents fighting for better programs in public school districts. She recently retired from the Los Angeles Unified School District where she was an autism specialist and administrator of autism programs.Dr. Kipke explained that Autism Spectrum Disorder is a very complex condition involving irregularities in the brain’s wiring circuitry. It is a spectrum disorder, meaning that disability can range from mild to very severe. Some of the characteristics of autism include problems with the use language to communicate, sleep disorders, seizure disorders, food sensitivity, allergies, lack of fine motor skills, and difficulty with social interactions. Because of the number of characteristics and the variability of these characteristics in terms of severity, determining the exact cause of the disorder, identifying treatments and finding a cure are all extremely challenging. Experts agree that autism is on the rise and it is unclear why. Dr. Kipke cited a recent California study that found a 633% increase in autism diagnoses between 1987 and 2002. A portion of this increase can be explained by better use of diagnostic tools, but experts say that this alone is not the entire reason. Dr. Kipke said that the cause of autism is still a puzzle to researchers in the field. It appears to be a “perfect storm” involving a number of factors. Certain genetic factors may be involved, the environment, or even exposure to a virus during pregnancy. Researchers are working on every angle in search of a solution to the puzzle. The current focus for treatment of is early intervention. Because most of the brain’s development occurs between the ages of 3 and 5 years, the brain’s wiring can actually be corrected if problems are identified early. However, the big challenge is to find what treatment works for which patient and to help families gain access to the treatments and services they need. Pat Grayson-DeJong showed the group a video produced by Autism Speaks and the New York Center for Autism. It gave a grim and heart-breaking view of the difficulties of raising a child with severe autism. Ms. Grayson-DeJong faced these difficulties herself when her son was diagnosed with autism more than 40 years ago. At that time, only speech therapy was available to children with autism. Schools were not equipped to handle children with special needs, and she was advised at one point to institutionalize her son. She refused and became a life-long advocate for both her son and other children with autism.Today, children with autism have many more services available to them, including accommodations and special classes in public schools. However, there are still a tremendous number of needs that remain unmet. Families with autistic children face emotional and financial difficulties that can be extremely stressful. Ms. Grayson-DeJong cited the 80% divorce rate among couples with severely autistic children as one sad reminder of the toll this strain can take. Additionally, another heartbreaking fact is that there are very few support services for children on the autistic spectrum as they enter adolescence. The Everychild members present at the salon agreed that this might be an interesting area for our foundation to explore for a possible future grant. Dr. Gary Rachelefsky, a recognized expert on asthma, spoke at the May 22, 2008 Everychild Foundation Salon on asthma. The event was held at the home of ECF member Terry Hamermesh and her family. Dr. Rachelesfsky is the Director, Executive Center for Allergy, Asthma, and Respiratory Disease and Professor, Allergy and Immunology UCLA Geffen School of Medicine Los Angeles, CA,To illustrate the devastation wrought by childhood asthma, Dr. Rachelefsky pointed to statistics that show that 8 million children suffer from asthma in the US today, and nearly one third of these are likely to be misdiagnosed and therefore not treated properly. There are approximately 250,000 hospitalizations due to asthma annually, putting a costly strain on the health care system. In addition, it is estimated that 14 million school days and 14 million workdays are missed annually due to asthma, taking a toll on both the economy and families. Asthma is more prevalent in urban versus suburban areas, and obese adolescents constitute the largest percentage of asthmatics. Many factors contribute to the prevalence of asthma in poorer urban areas, such as proximity to pollutants from factories and freeways. However, Dr. Rachelesfsky stated that indoor pollution is the primary culprit. For example, cockroaches and dust mites are irritants causing those living in infested homes and who are disposed to asthma to have frequent attacks. Additionally, the presence of cigarette smoke in many homes is another dangerous irritant. Because children in lower-income neighborhoods often spend a great deal of time inside due to the lack of safe playgrounds and unsafe streets, their exposure to such pollutants is often magnified. To combat these causes of asthma, Dr. Rachelefsky suggests regular insect extermination, plus the use of special mattress and pillow covers and outreach programs to curb smoking. There is also hope that, by working with the community to equip local clinics with pulmonary function machines, those with the disease will receive better care. The subject of the 11th Everychild salon was the importance of investing public resources in children early in their development. Everychild member Penny Meepos and her family graciously hosted the event at their lovely Pacific Palisades home on November 15, 2007. Early childhood development and infant mental health for children prenatal-to-three. Staff development and education to improve standards of childcare and parenting. Support for public policy initiatives regarding prenatal-to-three children and childcare issues. Mr. Atlas spoke of how the foundation arrived at its focus. He also described how the decision to devote resources to a narrow area of need has paid off handsomely. In addition, he gave several examples of how his business skills have aided his philanthropic ventures. Cindy Oser, a pediatric nurse and head of Zero To Three’s Western Regional office then spoke to the group. Zero to Three’s mission is to support the healthy development and well-being of infants, toddlers and their families. Zero to Three advances its mission by informing, educating and supporting adults who influence the lives of infants and toddlers. Ms. Oser spoke about the hopes and horrors of our smallest citizens. She cited studies and statistics which are both inspiring – the potential for early, enriching activities to allow children to reach their full intellectual and emotional potential – and terrifying; the lack of positive interactions in this early, critical period can set up a child for failure for the rest of his or her life. One of the major goals of Zero To Three’s work is to apply brain development research to practical programs to break the cycle of despair and lost opportunity which continues to plague generations of children. She also mentioned a Federal Reserve study on how proper intervention in the lives of toddlers can benefit society as a whole. The study results showed that adults who had attended pre-school, controlling for all other factors, led healthier, more productive lives and had higher earnings. Oser also gave several startling examples of the various small developmental “windows” that exist for children. She explained that if action is taken during these windows, it can provide a very high return on investment. For example, children born with congenital cataracts must have them extracted by a certain age. It not, the brain becomes hard-wired as it develops and, even if the cataract is successfully removed, the brain will be incapable of processing the newly found sight sent by the eye. Oser explained that approximately eighty-five percent of the physical architecture of the brain is completed by age three. The evening reinforced the importance of Everychild’s work to advocate for those who have no voice, and thus, improve the lives of children – and the society in which they will become adults in Los Angeles and throughout the country. Sherry Lansing’s first career was as a schoolteacher, and she has never lost her passion for teaching or her capacity to inspire. In February, 2006, over 75 Everychild members and their guests experienced this capacity first-hand at the home of Cheryl Saban, when the pioneering film industry executive (and Everychild Foundation member) spoke with Cheryl Saban about the role of women in philanthropy today and her own “third chapter” career as a philanthropist. From 1992 to 2005, Sherry Lansing was chair of the Motion Picture Group at Paramount Pictures, where she was the first woman in the film industry to oversee all aspects of a studio’s motion picture production. Lansing says she always planned to “stop working and start giving back” when she turned 60. In 2005, she left Paramount and founded the Sherry Lansing Foundation, a philanthropic organization focusing on cancer research, health and education. Lansing suggests that the reason people get involved in a cause is usually something personal – “it starts in your heart.” In her case, the early death of her mother due to ovarian cancer was her impetus to get involved in cancer research. Seeing stem cell research as the most important work being done in the field of cancer research today, she is now committing her formidable energy to ensure the implementation of Proposition 71, which provides for $3 billion in funding for embryonic stem cell research. In 2004, Lansing was appointed to the Independent Citizens’ Oversight Committee of the California Institute for Regenerative Medicine (established by Prop 71), where she is the patient advocate for Cancer and chair of the Governance Committee. She sees the successful passage of Proposition 71 — which began as a grass-roots citizens’ movement — as an example of “the democratization of philanthropy,” whereby a motivated group of individuals are affecting public policy. In discussing the role of women in philanthropy today, Lansing noted that it’s relatively new for women to have their own money to give away. Today, with their growing economic capacity and increasing longevity, women can accomplish much more in the non-profit arena, as Lansing is currently doing. She further suggests that women can make a difference by setting an example for their children, introducing them to the rewards of giving and preparing them to make good philanthropic decisions on their own. Lansing is also quick to point out that “you don’t need to have a lot of money to do a lot of good.” As more and more women develop professional skills, they are also contributing their considerable expertise in the non-profit realm. Lansing believes that the strengths that were key to her success in the corporate world are the same tools she is now using to make an impact in the non-profit world: a talent for collaboration, a capacity for getting the best out of people, not being afraid to hold a strong point of view, and especially, not giving up. In the past two decades, obesity rates have doubled for children and tripled for adolescents. The Centers for Disease Control and Prevention estimate that if current trends continue, one-third of all American children born in 2000 will develop diabetes. 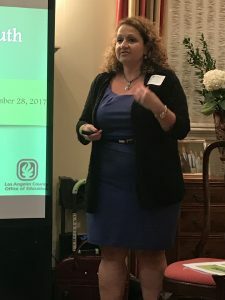 LAUSD School Board member (and current Board President) Marlene Canter has been a leader in Los Angeles in developing solutions to prevent obesity risk factors that begin in childhood. On May 25, 2005, Ms. Canter met with Everychild members, spouses and guests at the home of Karin and Jonathan Fielding to discuss the current crisis in obesity and diabetes and explore interventions to prevent this rising epidemic in Los Angeles children. The statistics are grim: 61% of American adults and 15% of children are overweight or obese. Obesity-related health costs in the United States top $100 billion annually, and the current generation of children is the first in our nation’s history to have a shorter life expectancy than their parents. In Los Angeles, Canter found that many sources of growing obesity could be traced to our schools. With LAUSD schools struggling to meet requirements for literacy and math in classes containing up to 70 students, there was less and less time or money for physical education. Students were surrounded by sodas and junk foods in school vending machines and fast food outlets in their neighborhoods. Realizing that children who drink sodas are more likely to become obese – and that LAUSD was spending literally millions on sodas on its campuses – Canter began by introducing a motion to ban sodas on LAUSD campuses, which was unanimously passed by the School Board in August, 2002. Subsequently, a second motion banning junk food was also passed; both went into effect in 2004 – the first such district-wide school ban in the nation. Canter is now focusing her efforts on providing healthier food alternatives for students both on and off campus, starting with school cafeteria food. Canter believes that major food vendors should be held responsible for changing kids’ perceptions about the foods they eat, for offering them healthy alternatives, and for encouraging healthy eating choices through differential pricing. Canter has also proposed setting up farmers markets on high school campuses, starting with one in each of the 8 districts, in order to provide students and their families with the access to fresh fruits and vegetables that is often sorely lacking in low-income neighborhoods. The rise in obesity and diabetes is “a preventable epidemic, and it’s growing,” says Canter. To respond effectively to this health crisis, she suggests, we need awareness, alternatives, and reinforcement. If we can create schools that enhance neighborhoods and build community, our schools can stop being part of the problem and become part of the solution to the obesity and diabetes crisis. The name Paul Cummins comes up often in conversations about educational programs for disadvantaged children in Los Angeles. An innovator in the field of education for over 30 years, Paul Cummins has focused on creating educational opportunities for all children, regardless of learning style, ethnicity, or economics. Cummins has founded two private schools (Crossroads and New Roads), joint ventured in creating four charter school campuses, developed an arts program for low-income schools (PSArts), and written extensively on the state of education in this country. He is currently Executive Director of the New Visions Foundation, where he is working on building an integrated, interactive, inclusive educational village in Santa Monica. In November, Dr. Cummins joined a group of Everychild members and guests at the home of Cynthia and Neil Alexander to explore the question of how to engage inner-city students in their own education and lower the massive drop-out rate – as high as 50% in some inner-city schools. Dr. Cummins spoke of “the two Americas” — one rich, the other poor — and shared these statistics: In many elementary schools, there is one counselor for 1000 students. At Manual Arts High School, out of 1800 entering freshmen, 900 leave before graduating, and only 30 graduates go on to college. Dr. Cummins suggests that it is vital to engage all students in their own education by involving them in subject matter and activities they find meaningful. Declaring that “engagement and meaning are the twin pillars of a successful education,” he claims that students are not bored or disinterested when their teachers address topics that relate to the world they live in, such as juvenile delinquency, homelessness, or the environment. Further, Dr. Cummins discounts the importance of testing, stating that “an absorbed student will become self-accountable by virtue of involvement with the subject at hand, which no amount of testing can dictate.” Students are engaged when they are encouraged to ask real questions and search for real answers; they are empowered by discovering what they can do to make their world better. Essential to Cummins’ educational vision are teachers with a passion for their subject matter and an ability to relate to their students – and teacher salaries consistent with the importance of their role in society. Like many societal ills, educational problems often become funding problems. At a time when budget deficits are causing statewide funding cuts for education, Cummins believes we can’t leave our children’s future in the hands of government; private foundations like Everychild must get involved. The challenges we face in repairing our educational system are daunting, but the human price we pay for leaving it broken is incalculable. On the evening of June 3, 2004, Everychild members, spouses and guests met at the Brentwood home of Liz and Greg Craig to explore critical issues affecting the lives of many low-income children in Los Angeles today. Speaking with the group was Dr. Jonathan Fielding, who as Director of Public Health for Los Angeles County, is responsible for all public health functions including disease prevention, health protection and health promotion for the county’s over 10 million residents. As former Chairman of the California Endowment and a current member of the city’s First 5 LA Commission (responsible for allocating tobacco tax dollars to improve health, development and school readiness of children aged 0-5 in Los Angeles), Dr. Fielding had valuable expertise to share with Everychild members regarding both key opportunities for improving the lives of local children and critical factors to consider in making funding choices. Literacy: 50% of the parents of children in Los Angeles don’t speak English at home – and maternal literacy is the single biggest determinant of a child’s literary success. Childcare: With nearly 70% of women in the workforce, the need for affordable childcare is critical, particularly for low-income families. While the First 5 LA Commission has committed $600 million to developing a universal preschool system, Dr. Fielding stated that this is only 20% of the funding that’s needed. Diabetes and Obesity: Obesity is the fastest growing epidemic in Los Angeles County, and concurrently, Type 2 diabetes has increased tenfold in adolescents. Current evidence shows that educating children and their parents doesn’t make a big difference. What’s needed are changes in the environment that promote a healthier lifestyle, such as exercise programs at school, less junk food in vending machines, financial incentives to produce more healthful foods, and places to live and work that promote walking rather than driving, climbing stairs rather than taking elevators and escalators. In identifying projects to fund, Dr. Fielding suggested that Everychild members ask ourselves, “What are we outraged about?” and then look for key leverage points to address the problems we identify. Do we want to continue to focus on specific groups of children by funding direct services and local capital projects? 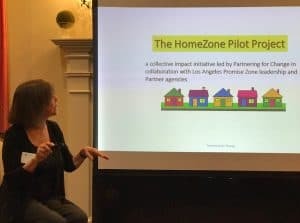 Do we want to get even more specific, selecting a smaller community of children within Los Angeles and funding a series of projects within that community, or focusing on a specific need over a period of years? Or conversely, do we want to consider affecting broad policy changes by funding advocacy for issues such as nutritional labeling, increasing the age for purchasing cigarettes from 18 to 21, or raising the tax on alcohol? Commenting that “giving away money well is one of the hardest things in the world,” Dr. Fielding offered valuable insights and thought-provoking questions for Everychild members to take away from our evening together. On Friday, January 9th, the Everychild held its 5th evening salon. The fascinating evening was graciously hosted by Member Mona Andrews and her husband, Anthony, at their home in Beverly Hills. Featured speakers were representatives of the ACLU who discussed their high-profile and controversial lawsuit, Williams vs. the State of California. Ramona Ripston, Executive Director of the Southern California Chapter of the ACLU spoke, along with Staff Attorney, Catherine Lhamon, and Amy Salyer, a public elementary schoolteacher and witness in the case. The lawsuit argues that the state has failed to provide an equal education for all public school students by virtue of the fact that substandard conditions exist in many classrooms in low-income areas. The speakers cited poor roofing, inadequate ventilation and heating/cooling, lack of working bathrooms, rat infestations, mold and classrooms which lacked not only enough desks and books, but in some instances, even teachers. Audience members queried the speakers as to whether or not the ACLU seeks additional funds from the cash strapped state in order to remedy the problems. Attorney Lhamon maintained that they are instead seeking an accountability system which would provide minimal standards, regular investigations of conditions in the schools and intervention to coerce implementation of the standards. The case is now entering its fourth year, and there are many people across the nation eagerly awaiting its outcome. Foundation members met at the home of member Randi Fett and her husband David in order to address the detrimental effect of community violence on school children in our city. Speaking to the group was Dr. Brad Stein, PhD, a researcher for RAND and Assistant Professor of Child Psychology at USC. Community violence is the daily exposure of children to violence in their environment. In a survey taken among urban youth in Los Angeles last year, 50% of the sixth graders surveyed had been exposed to violence within the last year, while 30% had been directly threatened with a knife or gun. Violence exposure must be addressed in schools in an effective and lasting manner, as it is an impediment to learning and focus in both social and academic situations. Currently, it is estimated that roughly 90% of children with PTSS do not receive the help they need. Such a disorder greatly affects a child’s ability to function in a classroom. Through its research, RAND has been following a new and innovative pilot program instituted by the Los Angeles Unified School District. With limited resources, it attempts to use social workers and resources already in place in a ten-session group therapy program. Not only is the program directly beneficial to the child, but family life is improved as children learn to talk to their parents about their problems. Although still experimental, RAND evidence shows that the sessions are creating astonishingly good short-term results, including improved grades and test scores. 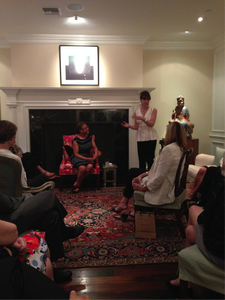 Nancy Daly Riordan, Everychild Advisory Board member, addressed members of the Everychild Foundation and their guests at a salon at the home of Dana and Edward Slatkin. Nancy, who is a longtime children’s advocate and founder of the United Friends of the Children and the Children’s Action Network, discussed ways in which Everychild could have an important impact with grants in the area of foster care and adoption. A focus of her talk was the fact that the foster care system is so flawed that every effort should be made to move children out of the system and into permanent adoptive homes. For children mired in the foster care system with no immediate prospects of adoption, tutoring and mentoring at their schools provides one of the most effective means of helping them to become more self-sufficient. Another key issue is the fact that there are no comprehensive, coordinated programs in place to help these children become adopted. As several attendees noted, “Everychild has its work cut out for it.” The Grant Screening Committee is currently examining several potential grants that could have an impact in this area. A recent salon featured State Senator Sheila Kuehl who spoke about children in domestic abuse situations and what can be done to help them. Senator Kuehl, an Everychild Advisory Board Member, is the state’s preeminent authority on this topic in legislative circles. She has authored numerous bills addressing this growing problem. She discussed the magnitude of the problem in our state, its root causes and some promising programs that Everychild could consider for a possible future grant. Such programs have proven to provide effective assistance to these children and include art therapy for the very young and theatrical presentations by students about abuse for older students. Former Colorado Governor and Democratic National Committee Chairman, Roy Romer, who is currently the Los Angeles Unified School Superintendent also addressed an Everychild salon at the home off Frankie and Barry Sholem. He spoke about how to raise secondary school test scores in LAUSD schools. Budget cuts have presented significant challenges to improving the academic performance of the students in these schools. However, Superintendent Romer outlined a plan for some promising reforms that will hopefully yield results in the near future. These included more reading instruction for students by subject area teachers and a program that will provide teachers with experienced teaching mentors. The Salon Committee also presented a screening of the Oscar-nominated documentary film, Children Underground, at the new Pacific Theatres ArcLight Theatres. Sheilah Kitt McKinnon, an Everychild Founding Member, is the film’s Executive Producer. Children Underground shows the everyday lives of Romanian street children, a most difficult subject. Ms. McKinnon discussed the making of the film and the prospects for reforms in Romania to help these children.